AN unbeaten multiple Gr.1 winner at two when he was rated the champion juvenile of Europe, and a classic winner at three when he won the 2000 Guineas by five lengths, Dawn Approach (IRE) has just finished his first southern season for Darley. The grandson of champion sire Galileo (IRE) covered 111 mares at $27,500 and looks just the type of horse to do well in Australia. His sire, the English Derby winner New Approach (IRE) (Galileo-Park Express by Ahonoora (GB)), champion two and three year-old in Europe in 2007 and 2008, shuttled for four seasons from 2009, his best so far in the south are Gr.1 winner May’s Dream (Archway) and Group winners Gamblin’ Guru (Fusaichi Pegasus) and Montsegur (Flying Spur), but he covered only comparatively small books (probably because he is a rig) and left just 220 foals here. New Approach is one of the boom young sires in Europe where his runners also include the Oaks winner Talent (Peintre Celebre), Gr.1 winner Sultanina (Zafonic) and Derby runner-up Libertarian (Darshaan). His fee there last year was £80,000 and remains at this level in 2015. New Approach and Dawn Approach were bred by Irish training and breeding maestro Jim Bolger (he also bred the dam of New Approach) and both were sold to Godolphin, the former (who subsequently raced for Princess Haya) at the end of his juvenile season and Dawn Approach after he had won the Coventry Stakes-Gr.2 at Royal Ascot at his fourth start at two. He then went on to win the National Stakes-Gr.1 and Dewhurst Stakes-Gr.1 and ended the year unbeaten in six starts with a Timeform of 126p, well clear of his nearest rival on 123. A powerful chestnut, Dawn Approach is out of the Phone Trick (Nearctic line) mare Hymn of the Dawn who cost Bolger just $US18,000 as a foal at a Keeneland November Sale, her attraction stemming from the fact that her second dam Kittihawk Miss (Alydar-Kittiwake by Sea-Bird) is a sister to 1983 Champion US Two Year-Old and multiple Gr.1 winner Miss Oceana. Hymn of the Dawn was fourth at her first start in Ireland for the trainer but failed in four subsequent starts and was retired. Her breeding record didn’t proceed all that swimmingly either as her only winner in four foals before being sent to New Approach was the minor handicapper Comadoir (Medecis). Part of his deal in selling New Approach to Sheikh Mohammed was the right to send 12 mares each year to the horse and Jim Bolger sent Hymn of the Dawn to the horse because of his willingness to take a chance with pedigrees that are, as he said, “a little dormant in the first and second generations”. Dormant the pedigree may have been under the first two dams as Hymn to the Dawn’s dam Colonial Debut (Pleasant Colony) only managed to place on the track (although her three winners include Gr.1 placed Galantas), but you didn’t have to look far to find gold. Dawn Approach’s fourth dam Kittiwake (ex Ole Liz by Double Jay), who died at the end of May 2000 aged 32, was one of the most influential mares in the US in the 1970s and 80s, and several branches of her family are producing good runners. Bred by Martin Anderson in Florida and purchased at two by the Hardin family’s Newstead Stud, Kittiwake won 18 races including the Matron-Gr.2 and Columbiana-Gr.2 (turf) Handicaps before breeding the six-times Gr.1 winner Miss Oceana, Gr.2 winner Larida (dam of Gr.1 winner Magic of Life) and stakes winner Ivory Wings. Sold for $US3.8m to Lazy Lane at the Newstead dispersal in 1985, Kittiwake bred five more winners including French Gr.1 winner Kitwood (Nureyev), a leading sire in Argentina (his son Estambul (ARG) stands in Tasmania) and Sea Wake (dam of Ocean Princess), a sister to Miss Oceana. Kittiwake was Virginia Broodmare of the Year in 1983 and ’84 and produced her final foal (Bridge Play) in 1992. Kittiwake is by the Arc de Triomphe and English Derby hero Sea-Bird (a grandson of Native Dancer) and is from stakeswinning juvenile Ole Liz, a daughter of notable broodmare sire Double Jay and the good broodmare Islay Mist (Roman-Evening Mist by Eight Thirty). This is family 4m and Dawn Approach’s eighth dam is Misty Isle (Sickle-Seven Pines by Haste), winner of the Matron Stakes. Dawn Approach made his debut in the first juvenile race of the season in Ireland, winning this 5f maiden at the Curragh in March (three of those behind him all went on to win their next start). Next time out, over 6f at Naas, the “laid back” colt needed little encouragement to score by 5.5 lengths and he was back at that track next start to land the Listed Rochestown Stakes-LR (6f) by 2.75 lengths after sitting behind the leader Mister Marc and then easily heading that colt in the straight. Taken to Ascot for the Coventry Stakes-Gr.2 (6f, good) at the royal meeting on June 19 he was again ridden by Bolger’s son-in-law Kevin Manning. The field of 22 included nine unbeaten runners and the favourite was eventual fourth placegetter Sir Prancelot (later winner of the Flying Childers). Ridden strongly to keep in touch with the leaders, Dawn Approach hit the front with more than a furlong to go and held off the fast finishing Olympic Gory (Choisir), who would win his three subsequent races that season including a Gr.1 in France, to score by three-quarters of a length with Cristoforo Columbo in third a neck back. Timeform said the winner’s effort in a “very strong renewal” had only been bettered in recent times by the eight-length victor Three Valleys and multiple Gr.1 winner and now Blue Gum shuttler Canford Cliffs. Given a three-month break, Dawn Approach, now racing for Godolphin, had his next start in the Vincent O’Brien Stakes (National Stakes)-Gr.1 7f on a yielding track at the Curragh on September 15. Suited by the fast pace set by leader Flying the Flag, he settled in third and quickened in the final furlong to win easily by 4.75 lengths from the Holy Roman Emperor-sired duo Designs on Rome and Leitir Mor (4.25 lengths). A month later he started firm favourite in the Dewhurst Stakes (7f) at Newmarket when he sat behind the leaders and passed stable mate and Gr.3 winner Leitir Mor in the final 150m to beat that horse by 2.75 lengths and give Bolger his fifth Dewhurst in seven years. Third placed George Vancouver (Henrythenavigator), who was a further three-quarters of a length back, won the Breeders’ Cup Juvenile-Gr.1 for Aidan O’Brien just three weeks later. Dawn Approach (126p) was awarded the fourth highest Timeform for a juvenile since the turn of the century, bettered only by Frankel, New Approach and Johannesburg and Racehorses of 2012 noted, “with his form so far ahead of his contemporaries it is easy to see why bookmakers have made him such a clear favourite for the 2000 Guineas”. Bookmakers also had him second favourite for the Derby (12f) at Epsom, but his trainer was more circumspect, believing the distance would not suit his colt. “It will only be his class and temperament that will enable him to get 10 furlongs and I think the horse will probably achieve enough at a mile and possibly a mile and a quarter to keep everyone happy,” he said. Dawn Approach went into the English 2000 Guineas-Gr.1 (8f) without a prep run and was always favourite, unbeaten Toronado next best after winning the Craven Stakes two weeks earlier. Pacemaker Leitir Mor led until two furlongs out in a strongly run race when Toronado took over but he was collared more than a furlong out by Dawn Approach who made it a one-horse affair, forging clear to win by five lengths in 1:35.84 from 150/1 shot Glory Awaits (Choisir) and with 2.25 lengths to Van der Neer in third, and that horse’s stable mate Toronado in fourth. 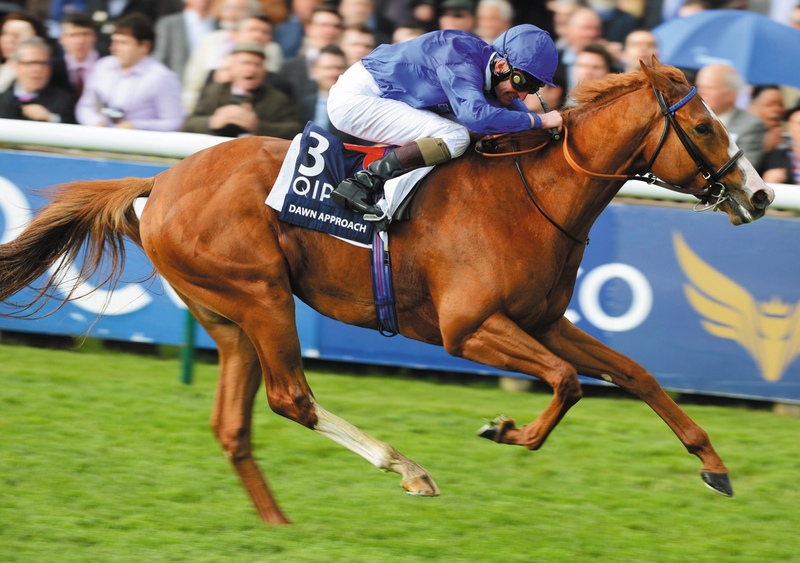 The dominance shown by Dawn Approach over the classic mile at Newmarket on May 4 perhaps pushed connections in the direction of the Derby on June 1, but the 12 furlongs at Epsom proved a disaster for the talented colt who refused to settle and took the lead six furlongs out. He was headed with three furlongs to go and was eased down in the final stages to finish last of the 12 runners behind Galileo colt Ruler of the World. He was back in action on June 18 in the St James’s Palace Stakes-Gr.1 (8f) at Royal Ascot and scored a narrow victory from Toronado (High Chaparral) to secure his fourth Gr.1 in just nine starts, running 1:39.23. That horse gained his revenge on a soft track next time out on July 31 in the Sussex Stakes-Gr.1 at Goodwood, with Dawn Approach hitting the lead in the final furlong and Toronado sustaining a late charge to get up by half a length, four year-old Declaration of War was a further 2.5 lengths back in third. Dawn Approach would have just two more runs, finishing fifth to Moonlight Cloud (Invincible Spirit), Olympic Glory, Intello and Declaration of War in the Prix Jacques le Marois-Gr.1 (1600m) at Deauville on August 11 and then fourth to Olympic Glory in the Queen Elizabeth II Stakes-Gr.1 (8f, soft) at Ascot on October 19. He was the first runner for his sire New Approach and one of three first crop Royal Ascot winners for the son of Galileo, the others being Newfangled and Tha’ir. They were among eight winners for the stallion who was Europe’s Leading First Crop Sire in 2012. A headstrong fellow who won eight races, New Approach was also unbeaten at two when his wins included the National Stakes-Gr.1 and Dewhurst Stakes-Gr.1. He was runner-up in both the English and Irish 2000 Guineas before winning the English Derby-Gr.1. He also collected the Irish Champion Stakes-Gr.1 (10f) and Champion Stakes-Gr.1 (10f) at Newmarket and was third in Juddmonte International-Gr.1, his six starts at three all coming in Gr.1 events and netting three wins, two seconds and a third. He was rated Europe’s Champion Colt at two and three. His sire Galileo (Sadler’s Wells-Urban Sea by Miswaki) won the English and Irish Derbys and the King George VI and Queen Elizabeth Diamond Stakes-Gr.1 and is rated the world’s best stallion. An instant success at stud, he claimed his sixth European sires’ title in 2014 with earnings topping $US18.6m. His 10 crops of racing age include more than 150 black type winners and his 41 Gr.1 winners include the outstanding unbeaten Horse of the Year Frankel (dam by Danehill). In 2014 his winners included triple Gr.1 winner and dual Derby hero Australia (now standing alongside his sire at Coolmore) and the much-travelled Cox Plate-Gr.1 winner Adelaide. He is proving a perfect foil for mares from the Danzig line, particularly those by Danehill, something also expected of Dawn Approach. New Approach is out of the talented Park Express, a daughter of Ahonoora, a sire who has also worked well with Danehill. She was an Irish champion at two and three when her wins included the Phoenix Champion Stakes-Gr.1. Park Express produced eight winners and she is also dam of the Gr.1 winner and sire Shinko Forest (Green Desert) and Gr.3 winner Dazzling Park (Warning), who is the second dam of Gr.1 winner Alfred Nobel (Danehill Dancer). Her daughter Park Heiress (Sadler’s Wells) produced South African Gr.3 winner Castlethorpe to a mating with Not a Single Doubt. Alluring Park (Green Desert), a stakes placed daughter of Park Express, produced the English Oaks-Gr.1 winner Was to a mating with Galileo. Second dam Matcher produced seven winners including black type hurdler Wing and a Prayer (Oats) and Listed winner Myra’s Best (Pampapaul), dam of Australian Gr.3 winner Forest Express (Kaaptive Edition). Listed winner Waky Na (Ahonoora-Matcher) produced Italian Gr.1 winner Waky Nao (Alzao). Third dam Lachine (Grey Sovereign-Loved One by Vigorous) won races from 5f-10 including the Listed Ebbisham Stakes at Epsom and two of her four winning foals scored at Listed level, while her Gr.2 placed son by Northern Dancer, Grand Chaudiere (CAN) found fame as a sire in Queensland and is best remembered via his daughter Easy Date, dam of Oakleigh Plate-Gr.1 winner and leading sire Snippets (Lunchtime). 6f record at Hollywood Park (1:09.2, then 1:08.80) and was retired in 1986 after breaking down during training for a tilt at the Breeders’ Cup Sprint-Gr.1. Her second dam, Colonial Debut (4mx4f to Double Jay), is by the 1981 Kentucky Derby and Preakness Stakes winner and champion sire Pleasant Colony, like Danehill’s dam Razyana, by the Ribot son His Majesty. Colonial Debut’s three winners include the Gr.2 runner-up and Gr.1 third Galantas (Tale of the Cat) while third dam Kittihawk Miss, by champion racehorse and sire Alydar (six Gr.1 wins, Leading US Sire 1990) left six winners from her nine foals to race including stakes placed Air Miss and the dam of stakes winner Sooner Superstar. As mentioned earlier, this is the family of Miss Oceana, Magic of Life and Kitwood. Dawn Approach is 5mx5m to Nearctic and 6mx5m to Raise a Native (and line bred to his sire Native Dancer and to Nearco) and should suit mares from the Danehill tribe, particularly those by Snitzel whose dam is by Snippets. He could prove a good foil for mares by Encosta de Lago and his sons (doubling the brothers Sadler’s Wells and Fairy King), and also mares by Zabeel (whose dam is by Nureyev, a three-quarter brother to Sadler’s Wells and Fairy King) or Testa Rossa (whose sire Perugino is yet another three-quarter brother to Sadler’s Wells, but this time by the speed influence Danzig). A very powerful horse, who stands 16.1½ hands, Dawn Approach had such a significant turn of foot it will be no surprise to see him get star sprinters here, especially when mated to mares by the likes of Canny Lad and others with Star Kingdom close up, as well as Bel Esprit and those from the Storm Cat line. It could also be useful to double up on Urban Sea and her family, and also Ahonoora (perhaps via daughters of Flying Spur’s son Shaft or Danehill son Danasinga).